Blinging in the New Year! I am so pleased to share this card with you this morning! Every year my husband asks me to create a simple Christmas card that he can hand out to all of his associates on various boards, committees, etc. on which he serves. This is the card I've designed for this year. 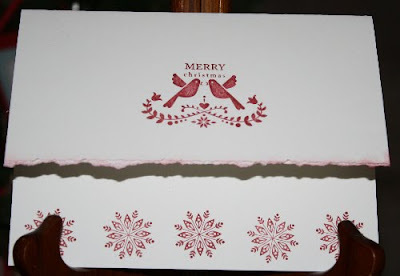 It is a CAS (clean and simple) design, using the Stampin' Up! Northern Hearts hostess set and a sentiment from Papertrey Ink's Mixed Messages set. I'll tell you what CAS card designs are not for the faint of heart. You have to be very confident in your stamping abilities because mistakes are easily noticeable and hard to cover up. The only thing I typically measure is the card front and some mat layers; otherwise, I eyeball everything. Measuring kind of takes some of the fun out of card making for me. For this design, I just ink up the stamps, take a deep breath, and start stamping! Hope you're having a great day today, and thanks for spending part of it with me! Such a sweet and beautiful Christmas card, Marcy--love it! Hope you're having a wonderful day, my friend!